The Big History of Humans identifies the major events in human history and connects these events using the idea of evolving complexity. The Big History of Humans identifies the major events in human history and connects these events using the idea of evolving complexity. We begin by asking what we might learn about human nature from relatively uncomplicated hunter-gatherer societies. Then we will trace the evolution of more and more complex societies from the prehistoric hunter-gatherers to societies created by the agricultural, industrial, and information revolutions. 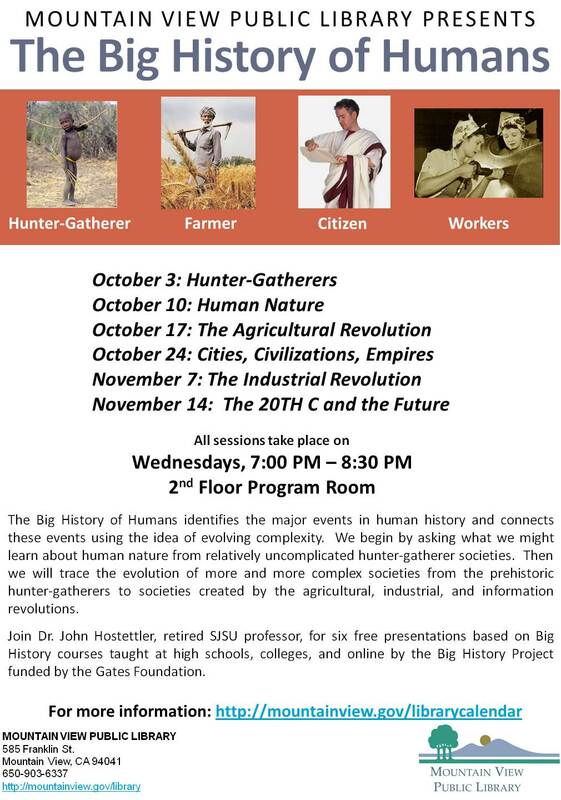 Join Dr. John Hostettler, retired SJSU professor, for six free presentations based on Big History courses taught at high schools, colleges, and online by the Big History Project funded by the Gates Foundation.